March | 2015 | Be the One. Clementines and Mandarins and Sunshine…Oh My! Over spring break this year, several college ambassadors had the awesome opportunity to travel to California for the week. Our trip was all about learning how the agriculture industry in California works in comparison to the industry we all know and love in Ohio. We visited many different farms, organizations, and companies during our time in California. We started in Sacramento and traveled a little over 1,000 miles south of there ending up in Los Angeles. One of our stops along the way was a citrus processing and packing facility, Fowler Packing, located in Fresno, California. Fowler Packing was started in 1950 and is a family owned business. Today they are one of the largest shippers in the fresh produce business. They handle over 15 million boxes of citrus per year and they own and farm two thirds of their own fruit. 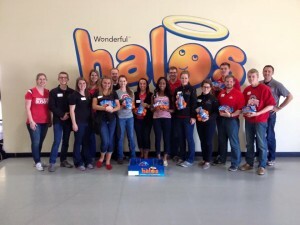 The facility that we visited while we were there was where they processed and packaged Halos, their brand of seedless and easy-to-peel mandarins and clementines. We were able to walk through the entire plant and see how the mandarins go from freshly picked through the process to be ready to package. There obviously isn’t a lot of citrus farming going on in Ohio, so it was a very interesting experience to see the way that industry works. The entire trip was a great learning experience and I’m extremely grateful that I was given this awesome opportunity. But for Ohio State…I would have never been able to take such an affordable, fun, and informative trip. Go bucks! Dr. Scott Vernon handed us a sticker with these words when we entered the central agriculture building. “As people in agriculture, we need to make people listen. The only way to do so, is with bold marketing,” said Dr. Vernon. Our college’s Ambassador Team went on an enrichment trip to California during Spring Break of 2015. On one of our last days of the trip, our team went to visit California Polytechnic State University. Here, we met with Cal-Poly’s ambassador team and various faculty members. Our first encounter was with Dr. Scott Vernon. In a teambuilding activity, Dr. Vernon had us stack around 13 nails onto a single nail. Through creativity, communication, and patience, members of our ambassador team figured out how to stack all 13 nails onto a single nail. After completing this task, Dr. Vernon congratulated the members who figured out the task. He used this assignment to talk about Cal Poly. With that, Dr. Vernon turned it over to Dr. Richard Cavaletto, the associate dean of the college. Dr. Cavaletto talked with us about the various facts of Cal Poly’s College of Agriculture, Food and Environmental Sciences. 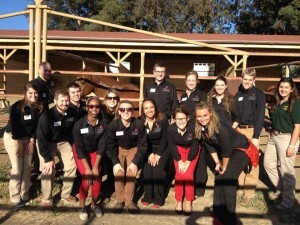 After our meeting with Dr. Vernon and Dr. Cavaletto, Cal Poly’s “Ag” Ambassadors gave us a tour of their campus. With the luxury of living in the warm area of California, we were able to walk through the dairy farm, horse stables and other animal areas. Beauty and fascination could describe Cal Poly’s campus; it was absolutely breath taking. You couldn’t help but stare off into the horizon at the mountains that housed multiple horse trails. If there is one thing our Ambassador Team took away from visiting Cal Poly was their philosophy. Our team hopes to envelop the ‘Learn-By-Doing’ philosophy so that we can better not only our college, but truly acquire the knowledge needed for our future careers. Thank you again to Dr. Cavaletto, Dr. Vernon, and Cal Poly’s Ag Ambassador Team!